This week I’d like to talk about something that I think is very important for our collective future, and is also very interesting. This amount may seem drastic, but readily available access to things like electricity, etc. seems to combat for approximately 4 million deaths annually from poor household air pollution, which is generally caused by traditional cooking practices. International research has shown that with more access to clean cooking fuels, we could easily avoid up to 1.8 million premature deaths as well as simply enhancing people’s well being. In order to do this, we would need to add between 21 and 28 gigawatts of energy in order to create the most modest amount of electricity for the average rural household. In addition to the costs, there is a need for a new set of dedicated policies to help households ease into cooking in better and cleaner ways. However, this is no small project, and would involve over 40% of the entire world’s population.The estimated cost of this would be approximately $750-1000 billion within the next 20 years. There are so many details and so much money involved, that even the head researcher Dr. Shonali Pachauri doesn’t fully believe that universal access to clean and modern energy is possible. In fact, she states in another interview that the scale of the investment is so enormous that it would probably require additional sources of finances from private companies. However, the benefits are equally enormous and thus we must all begin to consider whether or not these benefits out-weigh the bad. In addition to this study with its program, the UN also declared 2012 as the “International Year of Sustainable Energy for All,” and has made their own promises for 2030. Even without the establishment of a full program, even the barest framework would bring cleaner energy to up to 810 million people around the world in rural or impoverished areas by 2030. However, millions more in rural Asia and sub-Saharan Africa would remain without access to these modern energy sources. So, the next time that you’re cooking a meal in your more-than-likely modern kitchen, be thankful! Did you know that the city of Oslo, Norway is powered by garbage? Yes, guys. Garbage. Okay, before anyone gets nauseous, let’s put this into context, shall we? Here’s Oslo’s reasoning: All garbage really does is fill landfills. Right? Plus, not everyone recycles (unfortunately). Right? So we just have a bunch of useless stuff that takes up a lot of space. So why don’t we put all that stuff into a giant incinerator and make some energy? It makes a whole lot of sense, right? The entire city of Oslo is occupied by over 650,000 residents, and they are all happy campers. What a sustainable way to have energy. Just one problem though. They don’t have any more garbage. The United States of ‘Murica. Sweden already imports garbage from us for their energy. So…should we be embarrassed that we have so much garbage or proud that we are helping out another country? Gosh, so much irony here. What are your thoughts and opinions? Let us know in a comment below! Hey everyone, so as you guys know, Hurricane Sandy has been all over the news, and for good reason. It’s been wreaking havoc in the New York and New Jersey areas, and has really established itself as one of the worst storms the U.S has faced in recent times. One of the issues that has been raised in Sandy’s aftermath has been whether the storm was closely related to climate change, or global warming. One research scientist at The Earth Institute at Columbia University, Radley Horton has been studying the potential causes and conditions that resulted in Hurricane Sandy. In an interview with NPR Horton told them that while it couldn’t be stated that global warming was a direct cause of the powerful storm, connections between the two could be made. The rising sea levels and temperatures of the world’s oceans were said to be connected to the storm. As the planet warms up, the oceans heat up as well, and warmer water strengthens the power of storms like Sandy. Increased flooding could be the result of higher sea levels in the future. In a separate article, researchers at Beijing Normal University in China found that the frequency of large storm surges has increased since 1923, and that in warmer temperatures large storms are more likely. With these recent studies and with America dealing with Sandy’s aftermath, I think we should all look for climate change discussion to increase and hopefully gain a more important place in government policy. While we can’t know for sure that global warming is putting us at bigger risk of large storms, we can’t look past the connections. The articles are below if you guys want to read them, they give more examples of possible causes of storms such as Sandy and how climate change plays in. In light of our Bike to School challenge, we want to offer up a few tips (courtesy of Intown Bicycles) to help make your clean commute easy, less stressful, and most importantly safe. Now we know that it can be scary riding on roads alongside speeding cars, but if you use your head, stay focused, and be smart, you can avoid nearly all major issues. Tip #1: Be Visible. Now this may seem like an obvious one, but you may be surprised at how many cyclists and pedestrians don’t follow this advice. 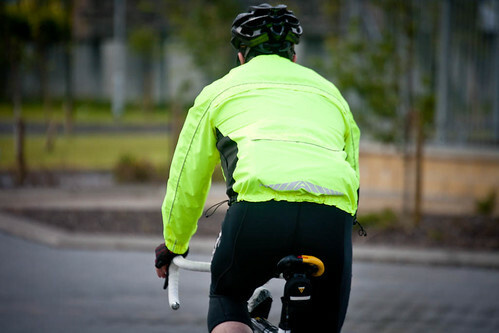 Make sure that you are wearing bright colors, and that your bike has an appropriate number of lights and reflectors. When you’re on your bike, you want car drivers to notice you from as far away as possible, so that they can plan to safely pass you. This is especially important at night. Wear yellow, it is the most eye catching. Do not wear grey, it’s the color of the road. Tip #2: Be Predictable. It’s important to be as predictable as possible so that other drivers can know what to do. Follow the rules of the road. Stop at all red lights and stop signs; signal when turning; yield to oncoming traffic; ride on the right-hand side of the road, and turn left from the left lane. Essentially, ride your bike as if you’re driving a car. Tip #3: Beware of Hazards. A lot of things that are bad for cars (pot holes, road plates, construction zones) are bad for bicycles, but there are additional things to watch out for when biking in the city. Watch for cars making left turns in front of you, and look for cars pulling out from side streets and driveways.Watch for cars that pass you and then make a right turn in front of you. Also watch for sewer grates, railroad tracks, and gravel or other road debris. These items can cause you to lose traction and fall, particularly if you hit them at high speeds or going around turns. Be aware that drivers cannot see the holes, debris, and other hazards that you have to negotiate. Signal drivers, if possible, before making any unexpected moves to avoid hazards. Tip #4: Plan Your Routes Ahead of Time. Putting a bit of time in to plan your route can pay off big time. Not only can you avoid the busiest roads, but you can find out which roads have bike paths, which traffic signals don’t recognize cyclists, etc. Make sure to utilize bike paths as much as possible. It is technically illegal to ride on the sidewalk (unless you’re under 13), however there are some situations where it is way safer – so use your best judgement. Tip #5: Be Prepared. First off, you should always have the proper safety equipment. Always wear your helmet (even for short trips), and wear reflective or bright clothing, as we mentioned earlier. It’s also important to carry some tools and supplies in the event of a problem. 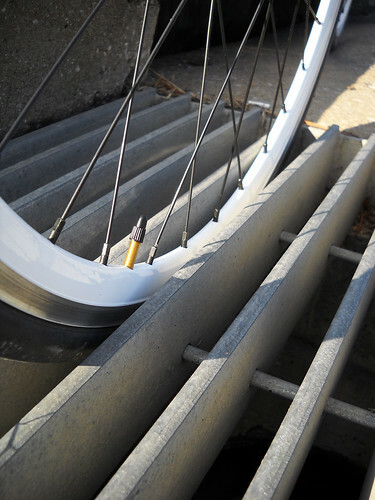 We recommend a spare tube for your tires, a patch kit, and a multi-tool, to help fix general mechanical issues. Tip #6: Pay Attention. This is another no-brainer. Make sure that you are constantly aware of your surroundings. 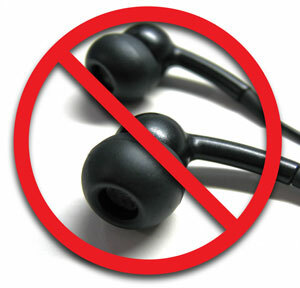 Unfortunately this means no listening to music. It’s important to use all of your senses to be aware. Don’t even think about trying to text while riding your bike. Not only are your eyes not on the road, but your hands aren’t on the handlebars, and you have no way to avoid a problem. It’s not worth the injury or the broken phone. For a full guide to bycicling in Georgia, see the DOT’s Georgia Bike Sense. The Atlanta Bicycle Coalition also offers courses on city cycling, and bike maintenance. …$78 million worth of big changes, to be exact. 16 year-old Azza Abdel Hamid Faias, an Egyptian student, has found a relatively cheap catalyst to help break down plastic waste and turn it into bio-fuel feedstock. Azza’s discovery was made when brainstorming on how to reduce Egypt’s trash consumption, nearly 100 million tons per year. The idea of breaking down plastic garbage to be used as a bio-fuel starter has been around for several years, however it’s Azza’s catalyst discovery that is the real breakthrough here. All other methods have been regarded as too costly to be efficient, but this newly discovered catalyst, aluminosicilate, has been proved to break down waste and simultaneously produce methane, propane, and ethane, which can be used to create ethanol. According to Azza, the technology could “provide an economically efficient method for production of hydrocarbon fuel,” including 40,000 tons per year of cracked naptha and 138,000 tons of hydrocarbon gasses – the equivalent of $78 million in bio-fuel. Azza’s proposal is already attracting loads of attention, including that of the Egyptian Petroleum Research Institute, as well as interest from major energy companies worldwide. At only 16 years old, this teenager has made a discovery that could change the world. We know she has a bright future ahead. We also know that she is not the only young mind working towards a better planet. Even ideas that seem small-scale at first can turn out to have a big impact. So we want to know, what things do you do make your part of the world better? Let us know in the comments! We’re all looking for ways to improve air pollution, and one way to do it is by eating green. The best way to “eat green” is to try to intake foods that have the least amount of impact on the environment. Restaurants are notorious for being huge sources of excess waste, such as water, energy, and resources like paper and other materials for containers and packaging. But there are tons of local, independent restaurants that buy organic and/or local food. Think of it this way: the average carrot travels around 1,800 miles to get to your dinner table, according to the Leopold Center. Imagine the amount of fuel that’s burned up along the way. Eating organic and/or locally can hugely cut down your impact on the environment. Also, try checking out the Green Restaurant Association (GRA), an organization that certifies restaurants as “green” based on a 1 to 5 star rating. GRA also helps restaurants, manufacturers and distributors become more environmentally responsible in a convenient, cost-effective way. Drink water instead of soda. It can take up to 132 gallons of water to produce a 2-liter bottle of soda, according to the Wall Street Journal. Not to mention the amount of pollution generated to create sodas and have them shipped! Bring your own reusable container for leftovers and let your waiter know that he doesn’t need to bring you a box. Think how much fresher your leftovers will be! – Chicken has a lower environmental impact than beef. – Seafood has a lower impact than chicken. – A vegetarian or vegan meal has the least impact of them all! We know that some of these ideas sound extraordinary, but even trying just one at any restaurant you go to will make a more positive impact on the environment! These tips can also apply to your everyday eating habits. Encourage your parents to buy organic and local. And try packing a lunch and bringing it to school! Remember to log your green eating habits on AirCreds for points and prizes!